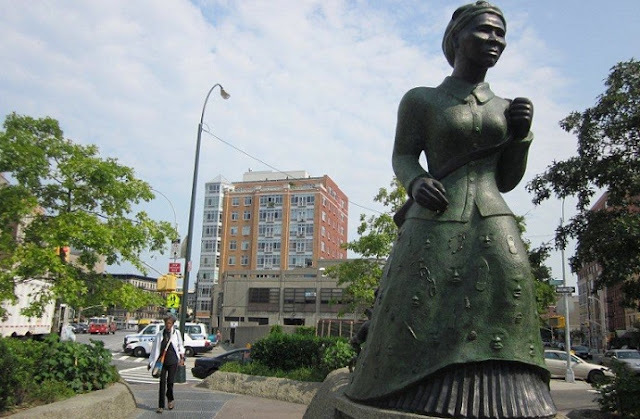 Harriet Tubman Memorial in Harlem entitled "Swing Low" by Alison Saar. When thinking about Harriet Tubman the first thing that one would think of would be her place in American history. Primarily for her work as an abolitionist and the Underground Railroad in the 19th century. When Susan Griffin thinks about Harriet Tubman she paints a rich tapestry of words that evokes her struggles and her strengths. The Bar None Group came across Susan Griffin's poem, I Like to Think of Harriet Tubman in the 2009 collection Poems from the Women’s Movement edited by Honor Moore. It seems appropriate to share Susan's poem on the occasion of Harriet Tubman's death on this day in 1913.